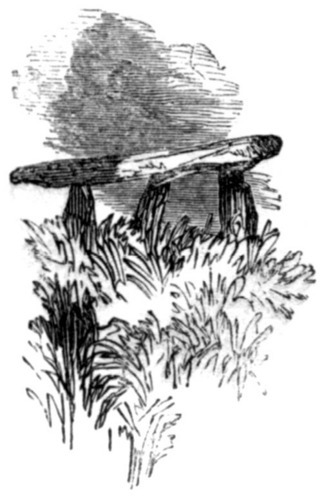 The monument collapsed in 1842, but was sketched by William Borlase in the mid-18th century, and the view shown here was included in Cyrus Redding's An Illustrated Itinerary of the County of Cornwall, published in the same year as the fall. 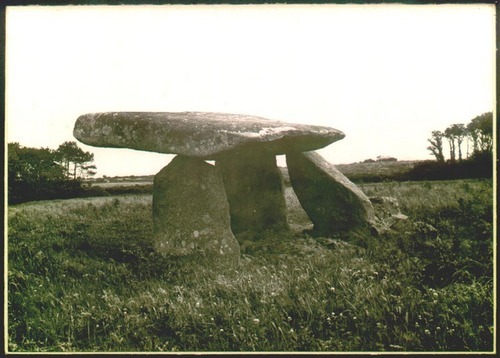 Some of the illustrations in Redding's book, such as those of Lanyon and Zennor Quoits, were likely to have been directly copied from those of Borlase, and this fact needs to be taken into consideration when viewing these in the light of the time of their publication. His sketch of "Caerwynen", however, differs markedly from that contained in Borlase's manuscripts, and reproduced in William Copeland Borlase's Nænia Cornubiæ, and both may well be representative of its appearance prior to the collapse. 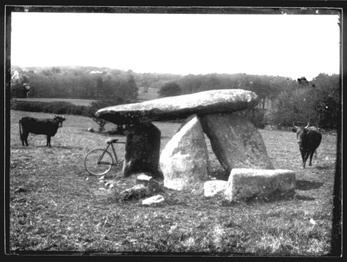 A view from a lantern slide of the cromlech known variously as Carwynnen, Pendarves or Giant's Quoit. The cromlech was re-erected soon after the fall of 1842, and was, according to William Copeland Borlase, "as a labourer asserted who assisted in the work, soon after replaced by the patriotic lady of the manor [Pendarves], in much the same position as before." He also goes on to say that "The two supporters at the south-eastern end seem to have retained their original positions. They were, formerly, respectively 5 feet 1 inch, and 5 feet 2 inches above ground. The single pillar at the other side has been moved nearer the edge of the covering stone…it measured 4 feet 11 inches high, but is now shorter. The covering slab, which, like the other stones, is granite, measures twelve feet by nine; one side, however, seems to have been broken in its fall. Some stones now standing on the north side, were placed there subsequently to the restoration." Image courtesy of and © David Thomas. 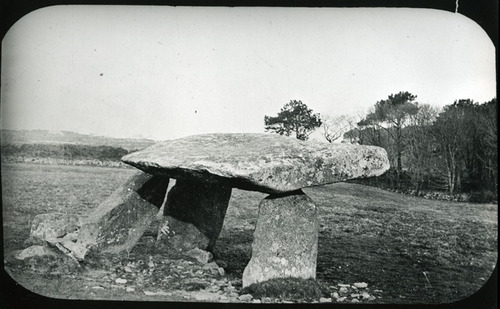 Another photographic view of the quoit as it stood at the turn of the last century. The tomb once again collapsed in 1967, possibly due, according to some locals, to a memorable earthquake of that year, and now lies in a jumbled heap. Plans to reconstruct the monument have frequently been considered, but the cost of reconstruction, and that of the necessary accompanying excavation, have always proved to be a major stumbling block, though it is welcome news that the monument is now top of the list of restoration priorities for the Historic Environment Service. The monument and the surrounding land have recently been acquired by The Sustainable Trust and work on the restoration should, hopefully, begin in the near future. Image courtesy of and © David Thomas. 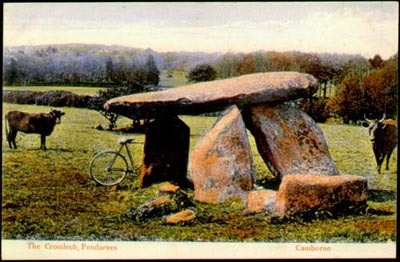 Two versions of the same photograph of Carwynnen Cromlech; the first shows the original photograph by William John Bennetts of Camborne and Hayle, and his bicycle can be seen leaning against the cromlech, and a postcard produced by Woolstone Brothers of London and using Bennetts' photograph with false colouring. Photograph courtesy of and © David Thomas. Postcard is from the author's collection. 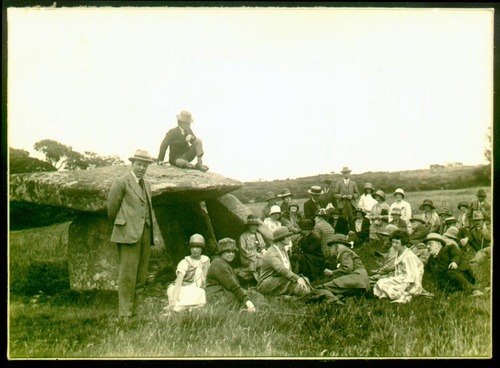 This photograph shows the summer pilgrimage of the Camborne branch of the Old Cornwall Society at the Giant's Quoit in 1925. The branch was founded in 1923 and this photograph shows a number of recognisable faces, including the Reverend James Sims Carah, vicar of Penponds and one time president of the COCS, shown wearing a boater and with a paper in his hands. Also shown are two other well known Camborne writers and antiquaries: James Thomas, rural postman and bard and a great collector of local folklore and antiquities, shown wearing a trilby and leaning back in the middle distance, and William Blewett, a painter and decorator who lived at Cross Street, Camborne and is shown standing to the left. Image courtesy of and © David Thomas.